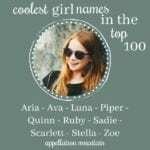 Let’s talk next wave girl names. We looked at the boys’ list a few days ago. 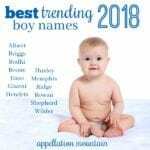 When the new US baby names popularity data came out, many remarked that the Top Tens felt stale. On the girls’ side, the Top Ten names remained the same as 2015; a few choices simply swapped chart position. Half didn’t move at all in terms of chart position. Check out the raw numbers, and it turns out that eight of the Top Ten girls’ names actually declined in use, in terms of actual births. Of the ten names in the 2001 Top Ten, three remain in 2016. Could big changes happen in the girls’ Top Ten? Maybe. Let’s consider some names to watch. 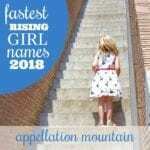 Where do we look for next wave girl names? About a week after the Social Security Administration releases the national data, they share state-specific Top 100s. 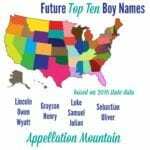 Those Top 100s often feature rising names, names new to state-specific Top Tens that have yet to crack the overall list. Some of these might offer the best hints at names to watch. For our purposes, I focused on names that cracked the Top Ten in other states – but this could easily be done by examining the Top 100, too. In addition, I’ve done some analysis of Number One girl names, and the patterns it suggests. Amelia makes the Top Tenc in 31 states, from Alaska to Florida, Hawaii to Maine. Some names on this list feel like maybes, but Amelia? I’d be shocked if this name never makes it into the Top Ten. For parents seeking strong names for girls, sweetly vintage Amelia comes with a world-changing namesake: aviatrix Amelia Earhart. Currently standing at #11 for the US, it takes little imagination to see Amelia appearing in next year’s Top Ten. The case for Evelyn is nearly as water-tight as Amelia. Evelyn makes the Top Ten in 21 states. Tailored and traditional in feel, it still claims a very currently sound thanks to Ev. With Ev- names, from the rare to the common, very much on the rise, Evelyn’s success seems likely. Evelyn ranks #12 in the US, right behind Amelia. Again, no crystal ball required to imagine Evelyn replacing Abigail or Emily at some point in the future. While the name’s roots are unisex, today Evelyn feels like a frills-free and conventionally feminine possibility. Nora makes the Top Ten in five states: Iowa, Minnesota, North Dakota, South Dakota, and Wisconsin. But doesn’t it sound like the kind of name you hear in certain upscale east coast neighborhoods? Nora strikes me as at home in Connecticut or Virginia, a traditional choice with an appealing simplicity. Two-syllable, ends-with-a names for girls have always fare well. Nora could be a sister for Emma – or a replacement. 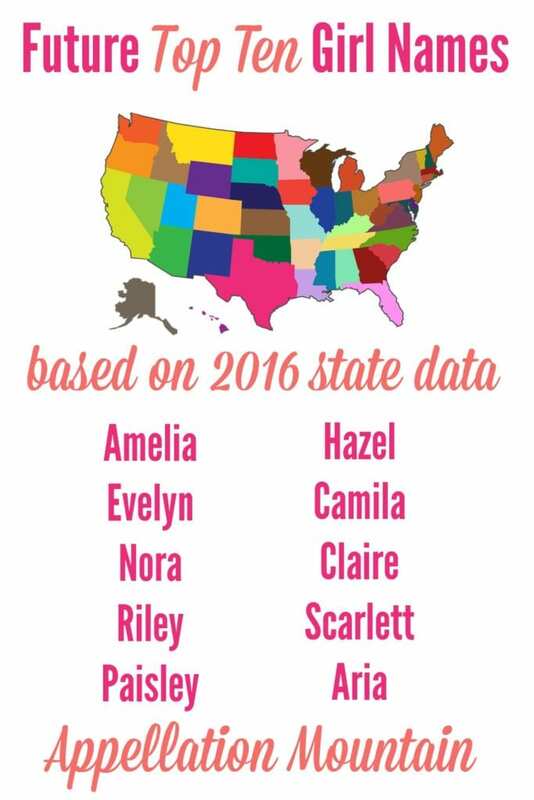 When I ran my number one names analysis, I gave Nora until 2031 to crack the Top Ten. Based on the math, and Nora’s current rank of #36, it seems possible – if unlikely to happen in the next year or two. If you’d asked me in 2014, I would never have put Riley on this list. It stalled out around the #40 mark, and then started to fall. Alternative spellings – hello, Rylie, Rylee, and Rileigh – abounded. Then something happened, and that something? Disney Pixar’s Inside Out, a smash hit from a studio known for successful animated films. While the characters at the heart of the action were personified emotions – Joy, Sadness, and friends – the girl to whom the emotions belonged was Riley. The summer 2015 movie changed things, and now this name has climbed to #22 in the US. It makes the Top Ten in Delaware, Washington DC, Hawaii, and South Carolina. Often names with multiple spellings fail to reach the Top Ten – though combined, the spellings make the name feel much more common. But could the power of Inside Out make Riley an exception? Most of the Top Ten names feel like broadly appealing choices. They’re the kinds of names that we avoid only because they’re too popular. Or maybe we decide that they’re so good that they deserve to be used anyway. Then there are the outliers. They’re names that feel modern, surprising, even polarizing. Brittany in the 1990s comes to mind. So do Tammy from the 1960s and Madison of recent years. I suspect Paisley might fill that same spot. After all, we love -ley ending names for girls, like another modern discovery: long-time Top Ten favorite Ashley. Paisley currently ranks in the Top Ten in three states: Arkansas, Mississippi, and West Virginia. Paisley comes in at #46 overall. In the boys’ edition, I spent some time looking at the impact of bilingual English/Spanish families. That’s why Julian and Sebastian fared so well on that list. But it’s every bit as much a factor on the girls’ side, so let’s look closely at Camila. Besides the name’s status as a Spanish import, singer Camila Cabello boosts the name’s profile, too. It’s close to botanical name Camellia – though it comes from an ancient Roman name, not the flower. And we do love our longer, feminine, ends-in-a girl names. If Sophia can crack the Top Ten, why not Camila? At present, the name fares best in California and Texas, thanks to that strong appeal as an English/Spanish crossover. But unlike Ximena or Yaretzi, it’s easy to imagine this name catching on with a broad cross-section of families, even those who don’t speak a word of Spanish. It ranks #32 in the US. These last four names feel like wild guesses. They make the Top Ten in just one US state. And yet, factor in strong growth patterns, plenty of positive pop culture associations, and on-trend sounds, and they could go the distance. Hazel makes the Top Ten in Utah only, but has climbed to an impressive #52 in the US. It’s as tailored as Harper, but feels like a feminine, vintage choice in the key of Abigail, too. Nature names have gone mainstream, though I’d call Hazel eco-vintage. After all, back in the 1890s, Hazel routinely ranked around #20. Between The Fault in Our Stars and high profile celebrity kids, Hazel continues to make headlines. Let’s see how far that takes this name. We tend to think that names rocket towards the top, and many do. But not all. Some climb steadily, until they surprise us all. Others bobble their way up, slipping and gaining over the years. Like Riley, Claire’s moment seemed over. But then it reversed course, and the name now stands at #40 in the US. Tailored, feminine, and French, Claire strikes a balance between the frills-free and the strikingly pretty. What explains the rise? Maybe credit goes to Claire Danes, currently starring in Homeland. But Danes is no newcomer. Could it be Modern Family’s Claire Dunphy? Much as we love Julie Bowen, the series premiered in 2007. Television also gives us Claire Coffee, but the timing still feels off. Instead, Claire might owe something to parents seeking alternatives to Charlotte and Abigail. Is that enough to power Claire into the Top Ten? It is in Utah, but we’ll have to wait and see. Scarlett stikes me as a name like Paisley in many ways. It’s utterly modern, unheard of prior to the twentieth century. Without Scarlett Johansson, it’s hard to imagine the name faring so well today. And yet, Scarlett ranks #18 in the US – easy striking distance of the Top Ten. The name has reached #10 in Nevada. If Harper and Madison can fare so well, why not Scarlett? Colorful Scarlett benefits from an association with Gone With the Wind. The heroine’s name – she was born Katie Scarlett, but that barely comes up in the movie – gives the illusion that the name has history. Instead, it exists almost exclusively as a surname prior to the 1936 publication of the novel. Now, though, Scarlett feels mainstream, familiar, and perhaps headed for the very top of the charts. Aria cracks the Top Ten only in Hawaii. And yet, if we’re talking about modern innovations with lots of room to catch on, Aria belongs on that list. Standing at #23 nationwide, Aria sounds traditional. That -ia ending puts it in the company of Mia, Sophia, and Olivia. We do like a word name, and musical Aria strikes the right note – it’s clearly a musical term, but seems easy to wear. Pretty Little Liars and Game of Thrones kept the sound very much on our minds, pushing the name up the charts. But it also fits in with popular picks like Ariana – though Aria is more popular today. It helps that we love the letter A for girls’ names, too. Speaking of A names, others I considered for this list were Avery, Aubrey, and Aurora. 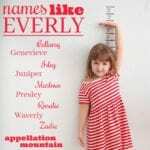 In Avery and Aubrey’s case, it feels like the names have already started a steady decline. (Though, as with Claire and Riley, that’s not always meaningful – or permanent!) Aurora could still climb, but from #66 to the Top Ten feels like a big jump, especially considering Aurora only makes the current Top Ten in Alaska. Piper struck me as a more serious contender. It feels like a cross between Harper and Penelope, a promising sound. Again, Piper stands at #67 in the US, and only makes the Wyoming Top Ten. So it feels like there’s not enough of a case to be made just yet. Other options include Elizabeth, a Top Ten favorite in sixteen states. I do think Elizabeth could easily re-enter the Top Ten at some point. But it felt too obvious for this list. It’s like saying that James will rise and fall, but is likely to remain in steady use. Evergreen Elizabeth should remain a favorite for many families, but I’m not sure that equates to a Top Ten spot. What do you think? Can you imagine any of these names making the US Top Ten? Is Claire’s recent rise maybe tied to the character Claire Temple played by Rosario Dawson on Jessica Jones? To me that seems like a more likely source than the ones you mentioned. I agree with most of your choices, but I think Mila is way more likely to go top 10 than Camila. And I agree with Amity that Penelope and Eleanor are very likely contenders. Kinsley could indeed wind up there as well, if you count variant spellings. Penelope, Everly, Nova, Luna, Eleanor, Mila, Kinsley, and Quinn also look quite promising. If I had to pick only ten names, I would choose Amelia, Evelyn, Scarlett, Aria, Penelope, Nora, Eleanor, Everly, and Nova, and Luna. Hazel also looks quite promising but I think it has a chance of the trendiness that drove it in in the past stalling out before it hits the top 10. Adeline and Adaline look very good as well, but alternative spellings work against them. Something that jumped out at me while I analyzed the data is names beginning with E are a significant trend for girls. Following my theory from the boys’ list. My money is on Amelia, Isla, Ruby. All are top 10 in Australia and rising in the US without a lot of spelling variations. Amelia may have peaked here – it is steady in popularity number but number of births has fallen (going off NSW figures, we don’t have whole country stats). Amelia is already Top Ten here in Oz. I’ve also heard it used for relatives named Amanda/Amy (Amanda rose earlier in Oz than in the US – there are grandma Amandas). It is top ten bound in the US for sure. Just quietly, I still prefer Amanda/Amy/Emily. Nora is split by variant Norah. Not sure I see either making Top Ten alone. I adore Claire and Hazel. Would happily use either/both. Claire has always been in the US Top Thousand. It’s not quite Elizabeth but it’s pretty timeless. I have loved Hannah since I was about five years old – and Hazel is similar. Plus, ‘eco-vintage,’ – great term btw – might be one of my most favourite styles. A lot of these names I either love or hate. Tiny shout-out to shut-out Ximena – surely that high scrabble letter value and distinctiveness could put it above Camila, which seems too easily messed about by Camellia, Amelia, Camille, Camilla? I’m not Spanish-speaking at all really but I love Ximena. My best friend’s middle is Ximena. She’s Chilean, and Ximena still seems wildly exotic to me, even though I live in California and know little Palomas and Aracelis and Xochitls.